ARE YOU READY FOR THE 8 WEEK ONLINE FITNESS, NUTRITION & LIFESTYLE COACHING PROGRAM STARTING IN MAY? This 8 week online coaching program for all ages and fitness levels and is about real food, real fitness and leading a healthy lifestyle to get you real results and to enable you to live a long, healthy quality of life. o 3 Key-topics for the week focusing on fitness, nutrition and lifestyle to read at your leisure through the week. So, are you ready to make some positive changes and join Tribe J.E.T? TRIBE JET Coaching programs begin on the first Sunday of every month. Spaces on the online coaching program are limited to 6 clients for each start date to ensure I can monitor each client’s progress and provide effective feedback each week along your 8 week journey. Sundays will also be your check-in day where you will send over your weekly progress photos along with the weekly review questionnaire so I can check your progress and give you helpful feedback on your journey as mentioned above. You will receive a weekly info pack on the Sunday morning when your 8 week program begins and on each Sunday thereafter until the end of the 8 weeks. 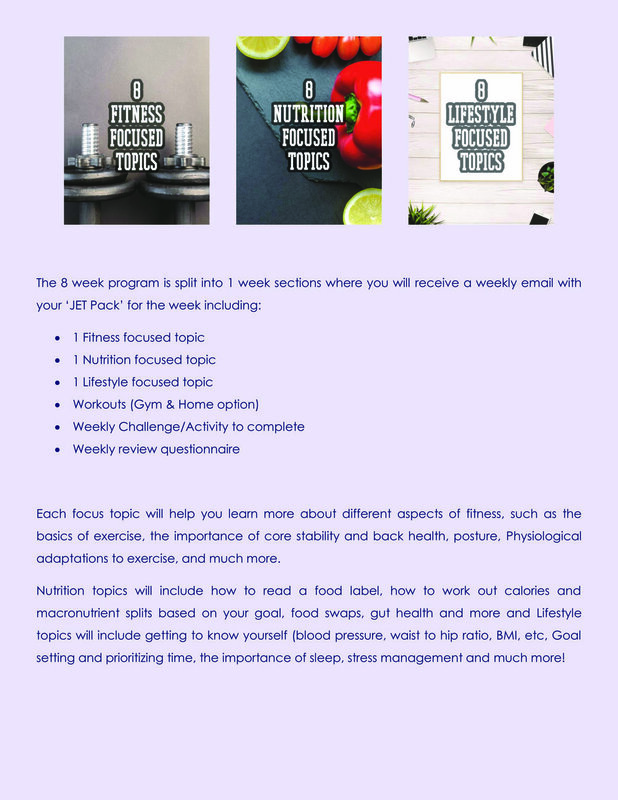 This info pack will focus on key areas of fitness, nutrition and lifestyle to enable you to learn and understand more about the food we eat, the exercise we do and the lifestyle we lead which should encourage you to be the best version of you and live a long healthy life. The cost of the 8 week online coaching program will be £80 (that’s just £10 a week!). For the official launch in May, I’m offering the course for just £40 to my first 6 clients! To enroll and secure your place at half price, click the paypal link below! AFTER PAYMENT IS COMPLETE, YOU WILL BE RE-DIRECTED TO A PAGE WHERE YOU CAN DOWNLOAD YOUR WELCOME PACK INCLUDING EVERYTHING YOU NEED BEFORE YOU START ON THE 5TH MAY.